Posted on December 21, 2014 December 22, 2014 by Adam Kraut, Esq. ATF is at it again in their latest determination later. Previously, I discussed their determination in relation to the sample that Black Aces Tactical submitted and hinted that ATF might be shifting its view on stabilizing braces. 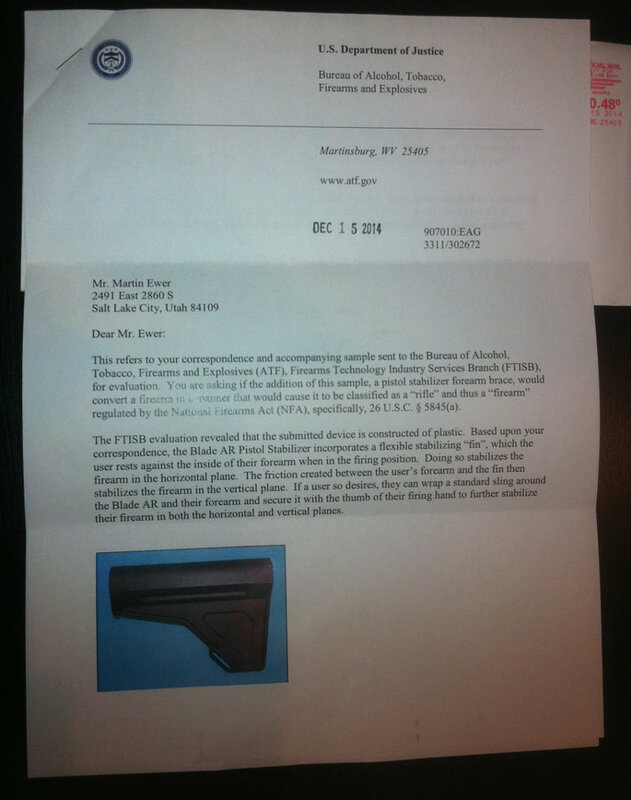 In the newest letter addressed to Martin Ewer, the Firearms Technology Industry Services Branch (FTISB) examined a device called the Blade AR Pistol Stabilizer (“Stabilizer”). The device itself incorporates a flexible stabilizing “fin” which is designed for the user to rest on the inside of their forearm when shooting the pistol. The “fin” stabilizes any lateral movement the user may experience without the device. 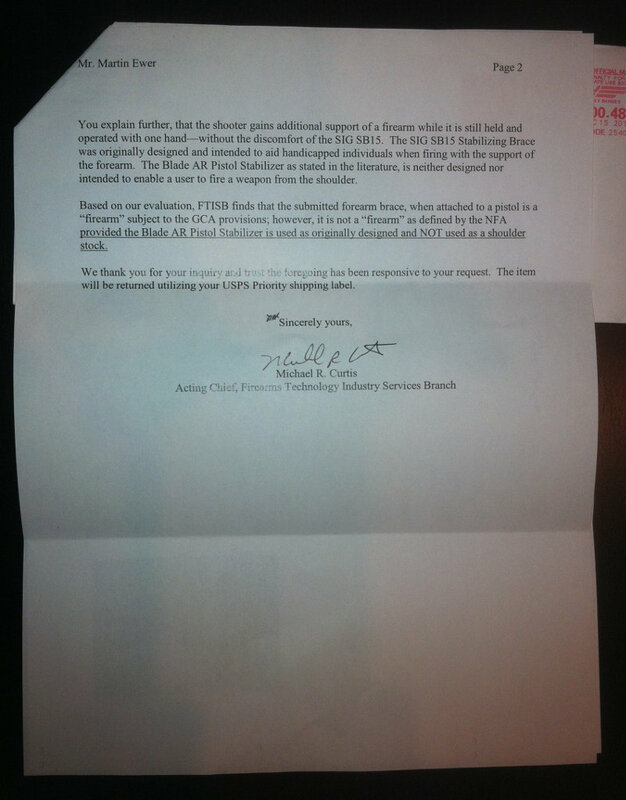 The letter notes that the literature included with the sample states the Stabilizer is not designed nor intended to enable a user to fire a weapon from the shoulder (Page 1 of the letter). FTISB correctly finds that attaching the Stabilizer does not turn the pistol into a “firearm” as defined by NFA, but then states “provided the Blade AR Pistol Stabilizer is used as originally designed and NOT as a shoulder stock.” (Emphasis added). The issue with FTISB’s latest determination is they are attempting to classify a firearm based on the end users use of an attachment designed and intended to be used in a certain way. A rifle is defined by the Gun Control Act of 1968 as “a weapon designed or redesigned, made or remade, and intended to be fired from the shoulder…” (Emphasis added). While a short barreled rifle is defined as “a rifle having one or more barrels less than sixteen inches in length…” (Emphasis added). The letter to FTISB stated that the device was not designed OR intended to enable a user to fire a weapon from the shoulder. So how does FTISB come to the conclusion that an end user shouldering the Stabilizer turns the firearm into an item regulated by NFA? If the device is not designed or intended to enable a user to fire a weapon from the shoulder then it would seem like a natural progression of logic that affixing the device to an AR Pistol would not satisfy the statutory requirements of being a rifle. And if the firearm in question isn’t a rifle, it couldn’t possibly become a short barreled rifle. Even if an end user used the device in a manner inconsistent with its intended purpose, that doesn’t mean that the person created a rifle. Using this twisted logic, wrapping paracord around a pistol buffer tube and shouldering it would transform an AR pistol into a firearm regulated by NFA because it wasn’t being used as “originally designed”. 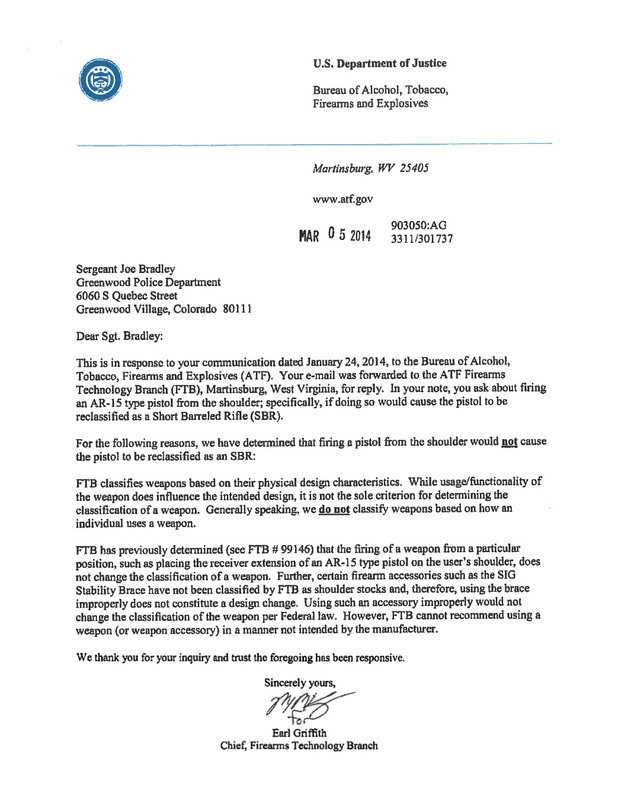 Referring back to a letter written by the Firearms Technology Branch (FTB) in March of 2014, FTB stated that “FTB classifies weapons based on their physical characteristics. 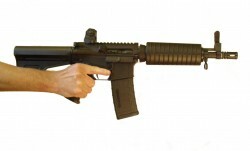 While usage/functionality of the weapon does influence the intended design, it is not the sole criteria for determining the classification of the weapon….FTB previously determined…that the firing of a weapon from a particular position, such as placing the receiver extension of an AR-15 type pistol on the user’s shoulder, does not change the classification of a weapon…Using such an accessory improperly would not change the classification of the weapon per Federal law…” (Emphasis added). Allow me to pose this hypothetical to you using the logic in this latest determination letter. 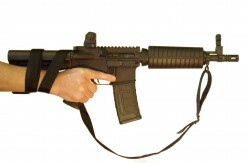 If an individual attaches the Stabilizer to his AR pistol, goes to the range, shoots it as the manufacturer intended and then hands it to his friend who shoulders it, did it just become an illegal short barreled rifle? Given what FTISB put in their determination letter it would seem that way. This begs the question, is ATF actually classifying the firearm based on what it is or how it MIGHT be used? Be sure to share this blog post by clicking the share links below! That natural progression of logic is what many people don’t incorporate into their thinking. This stabilizer looks like the perfect tool for one of my pistol students. She is 88 yrs young, shoots a full size XD 9mm. This could really be a benefit to her. 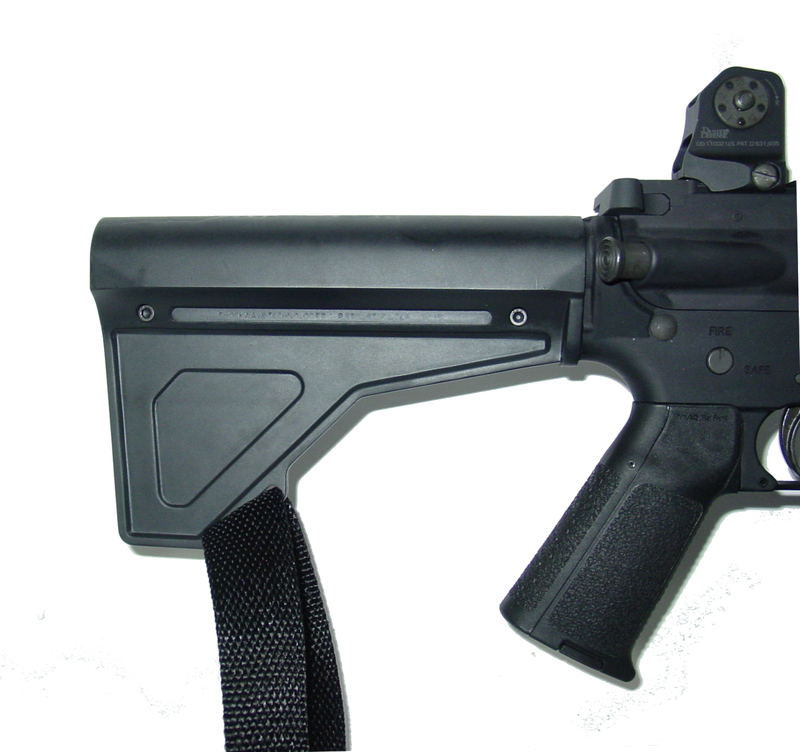 Pingback: Cinderella and ATF’s Determination: The Fairy Tale of an AR Pistol to SBR through Magic | Prince Law Offices, P.C. Pingback: Whoops We (ATF) Did It Again…Arbitrary Determinations Over the Sig Brace | Prince Law Offices, P.C. Pingback: Has the ATF changed their mind about the Sig brace? | The Law Office of John Pierce, Esq. Regulating ammo and firearms will not work – the same way it didn’t with Alcohol, tobacco and drugs. If someone wants them – they will find a way, legal or not. In fact, regulation of ammo, accessories and firearms will just assure that law-abiding people will not purchase them – criminals will then have a tactical advantage over any homeowner when they choose to kick down your door – locks, alarms, cameras and all. If you are a free-speech lover – you should recognize the importance the founding fathers gave to private ownership of firearms. You literally cannot have one without the other. In a country with ONLY the first amendment (i.e. lacking the second), the government could simply pass an unconstitutional ban on specific speech and tell the people “this is the way it’s going to be.” When the government is the arbiter and agency which determines the constitutionality and legitimacy of any petition brought on behalf of the people – you have a structural conflict of interest with no true way of redressing grievances of the people outside the courts. The founders believed in checks and balances, both inside the government itself (such as between the executive, judicial and legislative branches) AND between the government and the people. The second amendment (private ownership of arms) was intended to be the ultimate check on government tyranny by the people (read some of the founding fathers’ journals/books and the many books that have been written about the drafting of the constitution. If you go back and read both the first and the second amendments – you will see that their language is very broad and the clauses are expansive. In this country, we refuse to (in the vast majority of cases in case law) restrict speech (look to the strict scrutiny definition used by the Supreme Court) and I don’t understand how freedom-loving people can, on the one hand, fervently stand up to protect the first amendment and then, ignore the government when it tries to curtail our ability to own, use and bear firearms. It’s not so much about this particular ammo – my argument is more fundamental than that. In the same way that I oppose all restrictions on free speech, I oppose all attempts by the government to levy more regulations/restrictions on our already-limited ability to practice the second amendment. I understand that there are problems with firearms violence in this country but that is not an excuse to totally eliminate a founding freedom so necessary to the way of life our founders envisioned. Again, I want to go back to the first amendment. We have groups (like the neo-nazi’s, KKK, the black panthers and even Islamic extremists who sympathize with terrorist groups around the world) who openly call for the downfall of our country yet we allow them the god-given freedoms and protections granted by the very article they seek to destroy (see: irony). Why? Because if we started to eliminate their right to freedom of speech – where would it end? Freedom dies with a whimper – not a bang. Many misuse the slippery slope argument and far fewer understand the direct relation this concept has to case law concerning the first amendment yet I will draw this out to it’s logical conclusion. Say we have a group in this country that 99% of the people hate. This group calls for cloning Hitler, ethnic genocide, starting a nuclear-third world war and other politically correct goals along those lines. So we come together and pass a ban on their speech, preventing this group from assembling, publicly advocating their ideas and jail it’s leading members. How difficult would it be to take that precedent and apply it to the Neo-nazi’s, the KKK, the black panthers and any other group that ends up on Uncle Sam’s sh!t list? Well – I will tell you, it wouldn’t be that far of a legislative, executive or judicial jump to make once the precedent is set. So, ok, the vast majority of the American people would be cool with that right? Yup – as sad as it is to say, the average person knows literally nothing about the laws that protect them and while that really isn’t OK – this is a free country and people have the right to be morons if they want to be. OK, so we are on the second jump in the precedent of groups on Uncle Sams sh!t list – then some Senator gets up in the Senate and declares that all people who seek to destroy any part of the government are enemy’s of the state and need to be rounded up. Look at how fast that simple and even logical first step can snowball into something that resembles more Nazi Germany in 1944 than a free state? This is exactly what I see when the BATFE (ATF – they changed their name when they were reorganized into Homeland Security) starts to enforce bans on things like shouldering the Sig Tac brace for AR pistols and the future sales of XM855 5.56×45 62 grain ammunition. These are small little jumps that a majority of people don’t even understand. Outside the shooting community, this is probably the first time many of you have heard about such bans but my point is, unless we oppose such measures the same way we would oppose any restrictions on freedom of speech, how long will it be until the second amendment is a freedom in name only? The day that happens, the first amendment will have an expiration date set on it. Then, one day, the sun will set on this “free country” UNTIL and IF sanity is brought back to our government and I blame the partisanship of both political parties. In this country, we need to err on the side of more freedom – not less – because that is the true precedent set by our founders, our constitution and our traditions as a free people.